Here we go again. 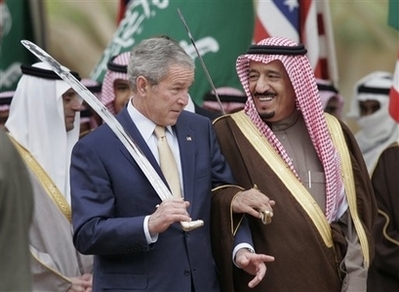 Another US President asks Saudi Arabia to pump more oil, despite the so-called US shale oil revolution. Fig 1: Is a tweet enough to make Saudi Arabia open its spigots? We have to dig a little bit into history to see the context of this remarkable tweet whereby we have to switch between events and later, delayed analysis with the benefit of hindsight. The original video link is broken but the wording has been documented by Gail the Actuary (Atlanta, Georgia) in this Oildrum post. Obviously, Bush had realized what was going on. 3 years earlier he had already tried it, when oil prices went through the $50 mark. CRAWFORD, Tex., April 25 – President Bush discussed the surge in oil prices with Crown Prince Abdullah of Saudi Arabia on Monday, but focused on a plan by the Saudis to increase their oil-pumping capacity over the next decade rather than on any short-term efforts to bring prices down. 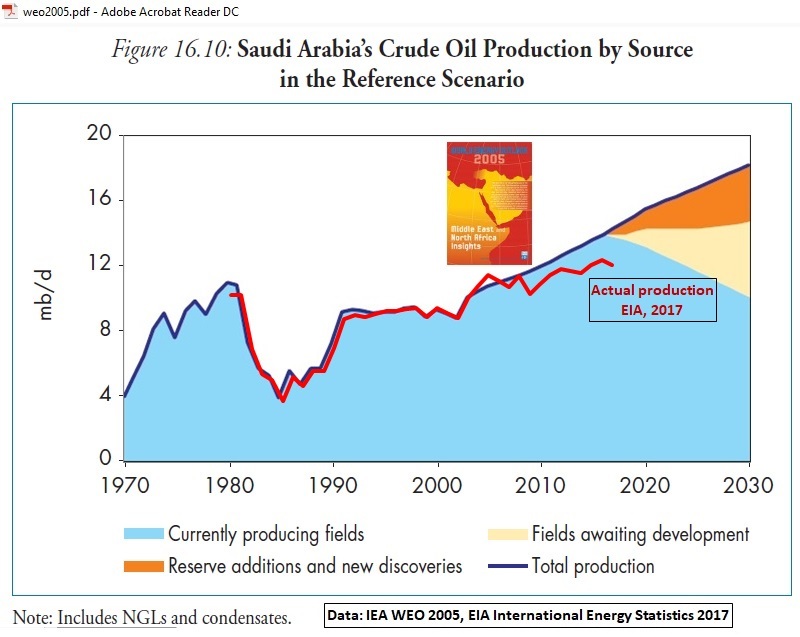 Saudi Arabia’s plan, which it began discussing publicly weeks ago, calls for spending up to $50 billion to increase its maximum sustainable production capacity to 12.5 million barrels a day by 2009, and to 15 million in the subsequent decade, from about 10.8 million barrels now. 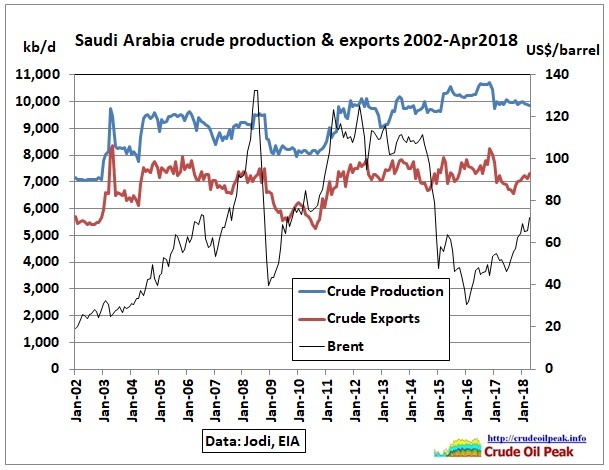 The Saudis are currently pumping about 9.5 million barrels a day. This Saudi Aramco slide show was presented at the Centre for Strategic and Internatiaonl Studies (CSIS) right in Washington, by Mahmoud Abdul Baqi, vice president for exploration and Nansen Saleri, reservoir manager. The Synopsis even refers to 15 mb/d. 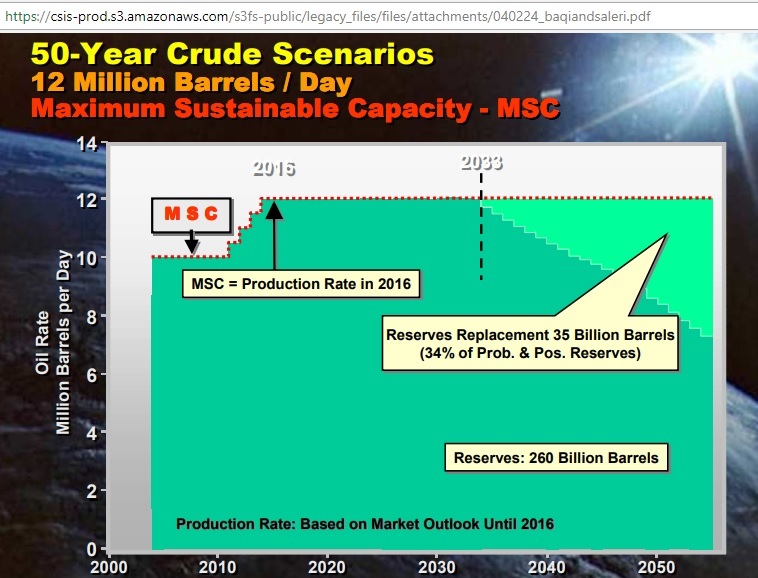 In the above graph, the dark green area is around 200 Gb and the decline in production from “proven reserves” after 2033 is 1.8% pa. 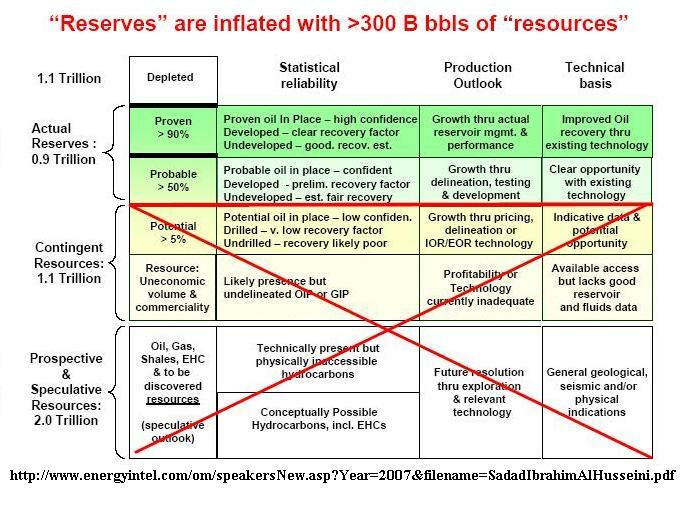 Note that after 2033 probable and possible reserves are needed to continue at 12 mb/d. For a production level of 10 mb/d that point would move to 2042. The oil in the above table includes NGLs. Crude oil would be around 85% of the total. 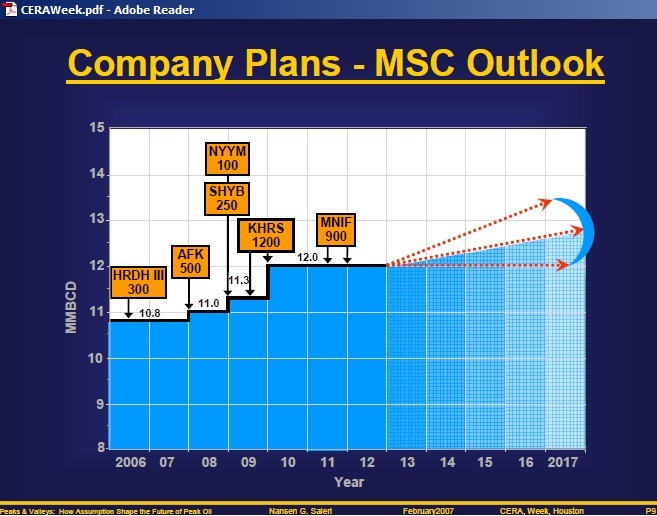 So 14 mb/d in 2010 were some 12 mb/d of crude oil when the MSC was still 2 mb/d less. The matching oil price for the reference Saudi production in 2025 was assumed to be $35/barrel in $2003 and $60/barrel in nominal dollars. 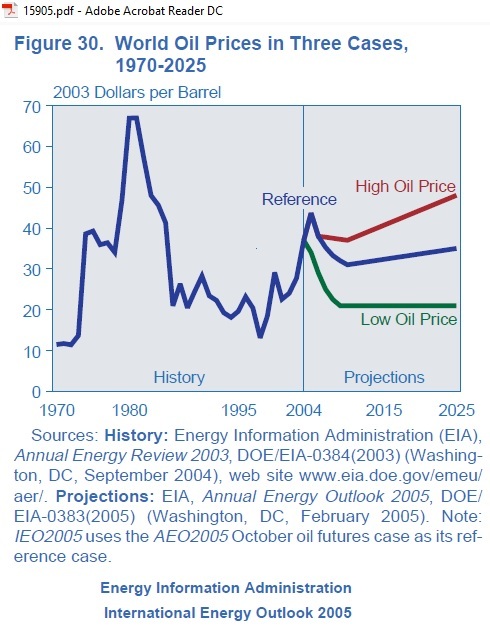 Almost 1 year before Bush’s 2008 Canossa walk to Riyadh, in February 2007, Dr. Nansen Saleri did another slide show for the annual conference CERAWeek of Cambridge Energy Research Associates in Houston, Texas, entitled “Peaks and Valleys: How assumptions shape the future of peak oil”. 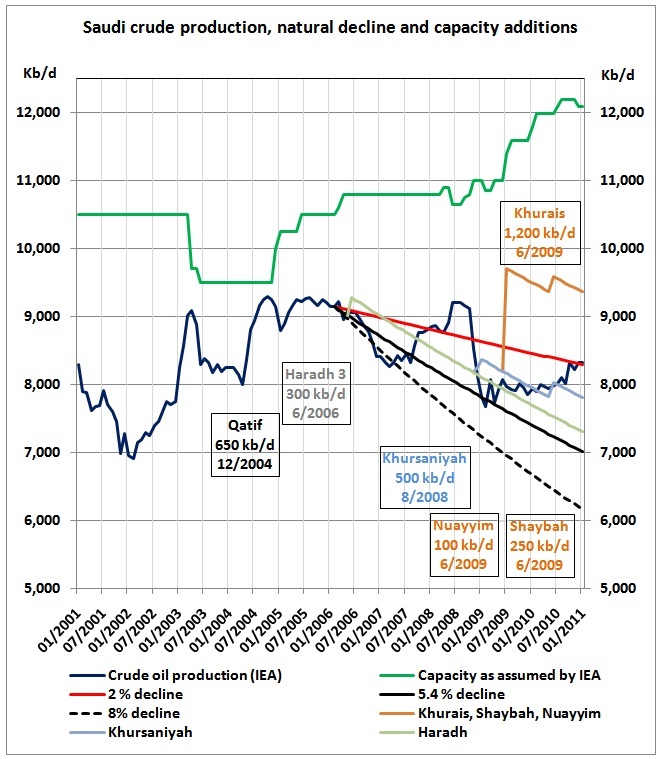 The above chart is a bit more detailed than the earlier 2004 version, showing the contributions in kb/d from various additional projects adding up to 3.25 mb/d while the maximum sustainable capacity increases by only 1.2 mb/d. The implied decline in existing fields is 2 mb/d over 6 years or around 300 kb/d pa.(3% pa). Note the aspirational trend toward 14 mb/d. SUMMARY: On November 20, 2007, Consul General and Econoff met with Dr. Sadad al-Husseini, former Executive Vice President for Exploration and Production at Saudi Aramco. 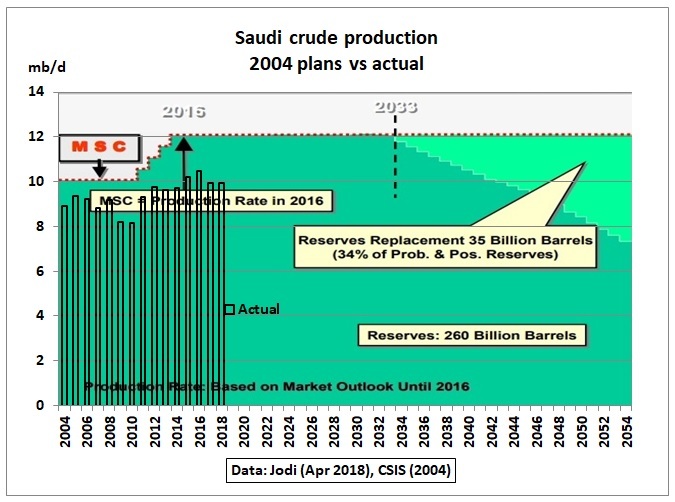 Al-Husseini, who maintains close ties to Aramco executives, believes that the Saudi oil company has oversold its ability to increase production and will be unable to reach the stated goal of 12.5 million b/d of sustainable capacity by 2009…. Interesting that the Embassy interpretation was that of a speculation. While Matt Simmons’ oil production estimates in his 2005 book “The Coming Saudi Oil shock and the World Economy” were much too pessimistic his warning was justified. Additional Chinese oil demand for the Olympic games in August 2008 was also a contributing factor for the 2008 oil price shock. In February 2011, when the civil war broke out in Libya and Saudi Arabia was asked to offset Libyan oil production losses the above Wiki Leaks cable was published by the Guardian. 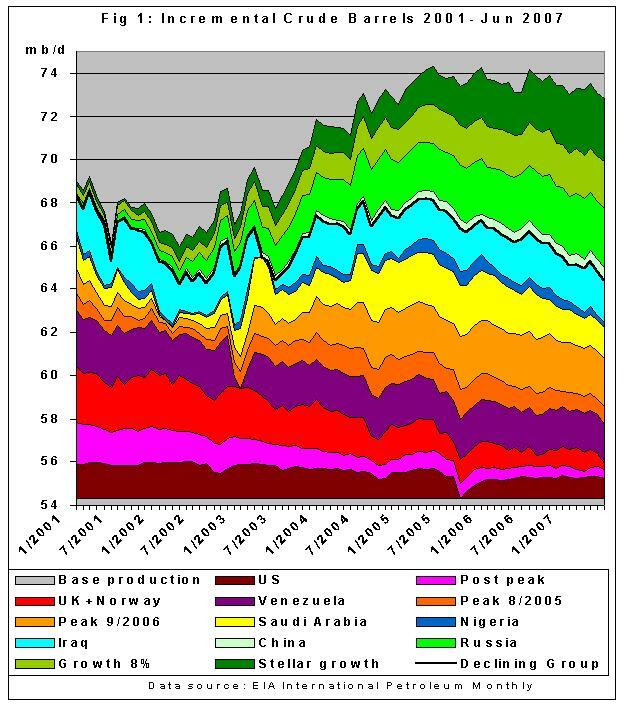 Prof. Kjell Aleklett describes this in his book “Peaking at Peak Oil”, chapter 13, p 184. 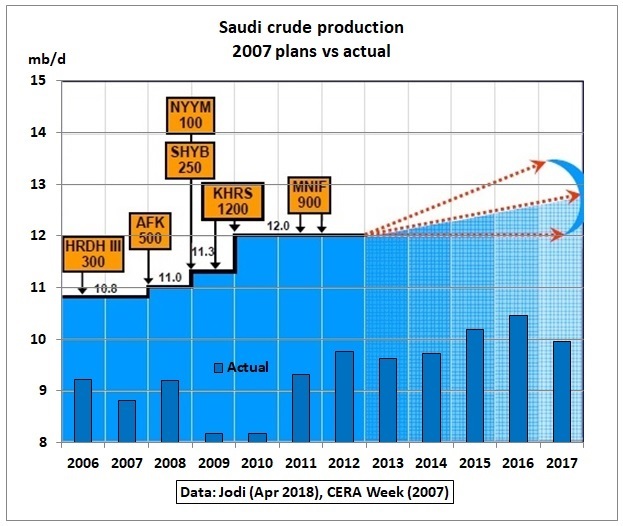 The following post done at the time shows how declines in Saudi oil fields fit into Saudi Aramco’s 2007 plan (Fig 8), together with incremental production increases and theoretical capacities. 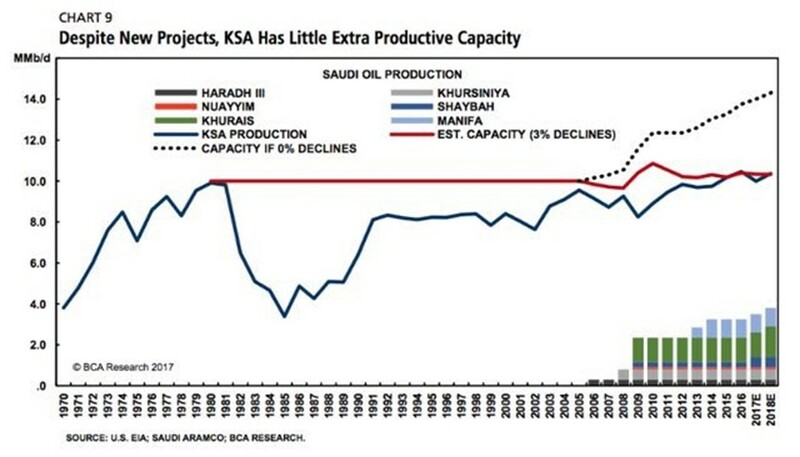 The above graph shows that Saudi production capacity has basically remained flat as additional projects have just offset decline in existing fields. 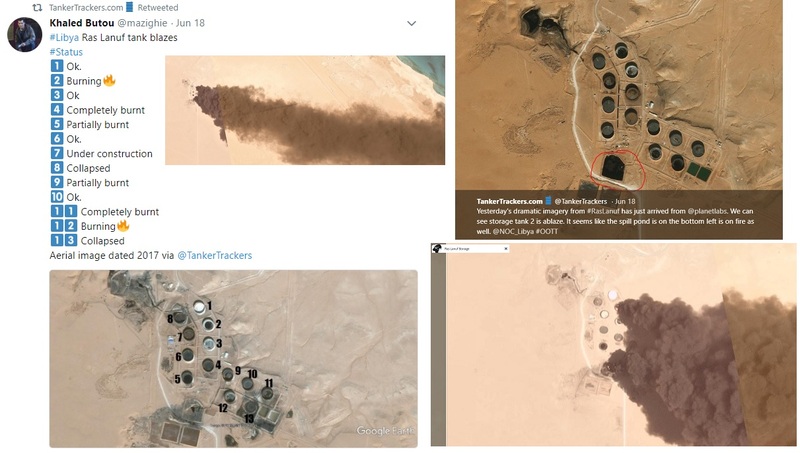 Fighting over oil terminals in Libya has started again. Starting with Saudi crude production of 8.2 mb/d in January 2010, the yellow area depicts Saudi production nominally (that is without considering oil grades) replacing Libyan production losses. The orange area represents production exceeding 8.2 mb/d and additionally available (6 year average around 900 kb/d). 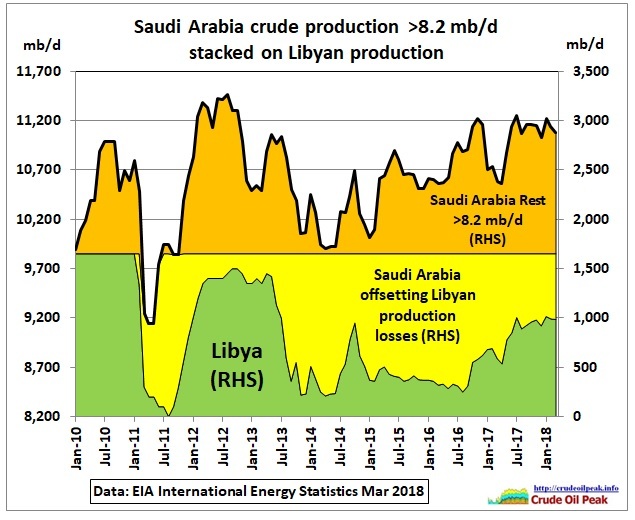 So if Libyan oil production drops again over several months, the same 2011 problem comes back, only at a higher Saudi production level, closer to an uncertain production capacity. 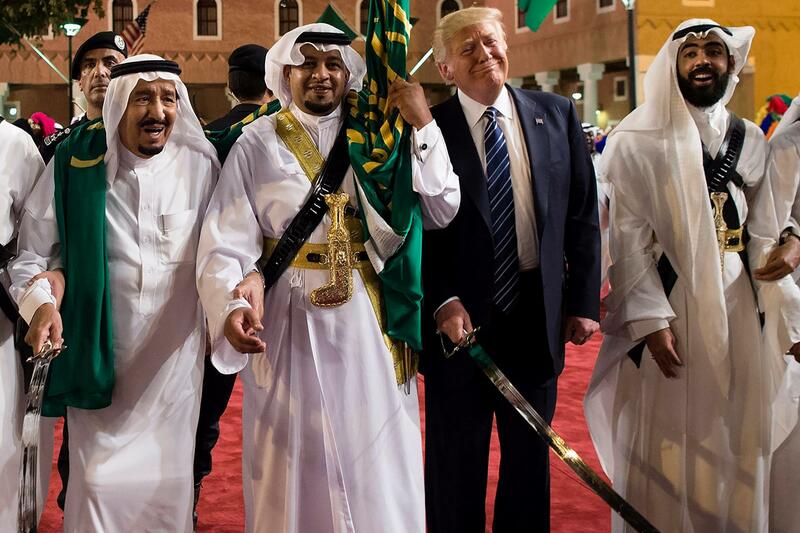 President Trump (or any other future US President) will have to attend several more sword dances to get the Saudis to sustainably pump more oil.